Karachi: Pakistan’s leading oil company, Byco Petroleum’s Single Point Mooring (SPM) has imported 10 million tons of POL products and celebrated six years of safe continuous operations since its inception today. Byco’s SPM has been operating since 2012 including the severe monsoon season, which was previously considered impossible for the area. Byco’s SPM is Pakistan’s only floating terminal and revolutionizes the handling of crude oil and refined petroleum products in the country. The SPM has been set up in the deep sea and is connected to a storage tank via 15 km of both on-shore and sub-sea pipelines. Byco has a storage capacity of 243,000 metric tons. 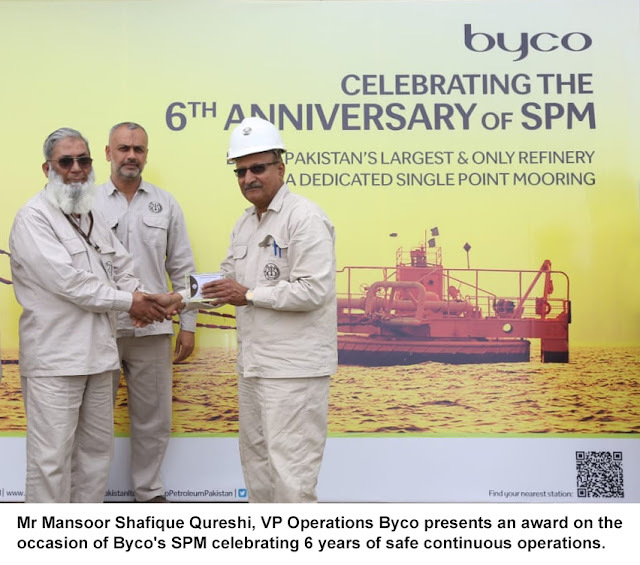 Byco’s SPM allows Byco to import and export crude oil and refined petroleum products directly, significantly reducing traffic at Pakistan’s ports situated in Karachi and Port Qasim, and saving the associated delays and demurrage charges. It enables Byco to be the only vertically integrated petroleum firm in the nation.